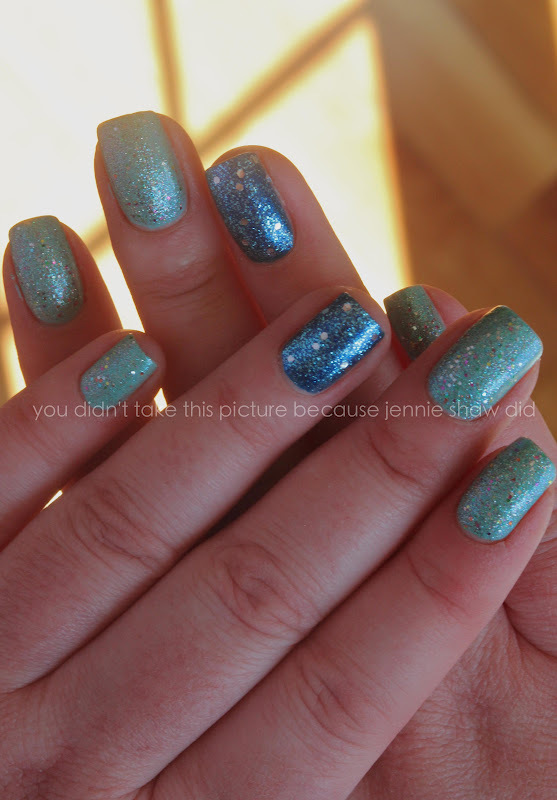 jennie's nails and tales: The Nail Files: How Could You Be Blue With Nails Like These? The Nail Files: How Could You Be Blue With Nails Like These? This week, I kicked it into high gear. China Glaze's For Audrey & Optical Illusion, OPI's Swimsuit...Nailed It, China Glaze's Dorothy Who? and OPI's Gone Gonzo. Two coats of For Audrey and Swimsuit...Nailed It. Then one coat of Optical Illusion over For Audrey and one coat of Dorothy Who? over Swimsuit...Nailed It. After careful consideration, my feature nail wasn't quite sparkly enough (ha), so I added one coat of Gone Gonzo. Yes, it did take forever to take off but it was totally worth it. In the sunshine, I had to wear sunglasses or risk being blinded by the blue-bling. Again, it was totally worth it. Thanks to Tara and Vicki for hosting!! I love it! I don't think you can ever have too many sparkles on your nails. Ok, how did we both manage to blog about blue nails this week?!? Haha! Yours are blingy, very nice! Holy crap. LOVE them!!! And now I want all of those nail polishes! you never disappoint! absolutely gorgeous! So so pretty! Love them!!! Your nails are perfect too! These look awesome! I love all that sparkle! Wow, your nails look great!! Love it! Great color. I love the polish. Your nails are look cute. Glitter look superb..Love it.